This post is sponsored by Marshalls, but all opinions are my own. Thank you so much for supporting the brands that make LVN possible! Good morning sunshine and happppppy Wednesday!! So you wanna hear something crazy? It snowed at my house yesterday. Yep, true story. It wasn’t much, but enough to officially count as our first snow of the season. Now I know you’re probably expecting me to start complaining, but I’m trying to change my attitude so I’m not going to do that. Instead I’m trying to see the positive side of the colder months and appreciate the good parts about this time of year, like how warm and cozy the house feels when a cold breeze is blowing outside, or how nice it feels to curl up with a soft blanket and a good book. 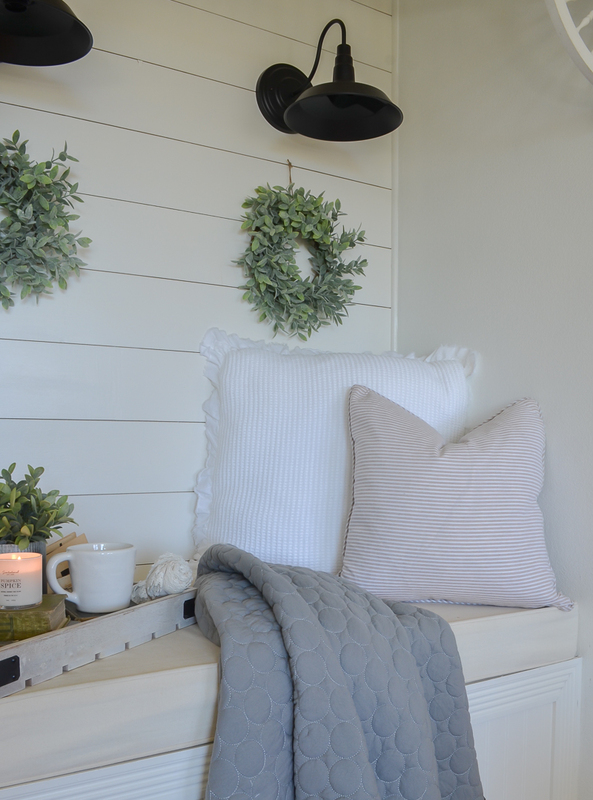 And that’s actually what inspired today’s post, which is all about how I’ve made our reading nook extra cozy for the cold months ahead. 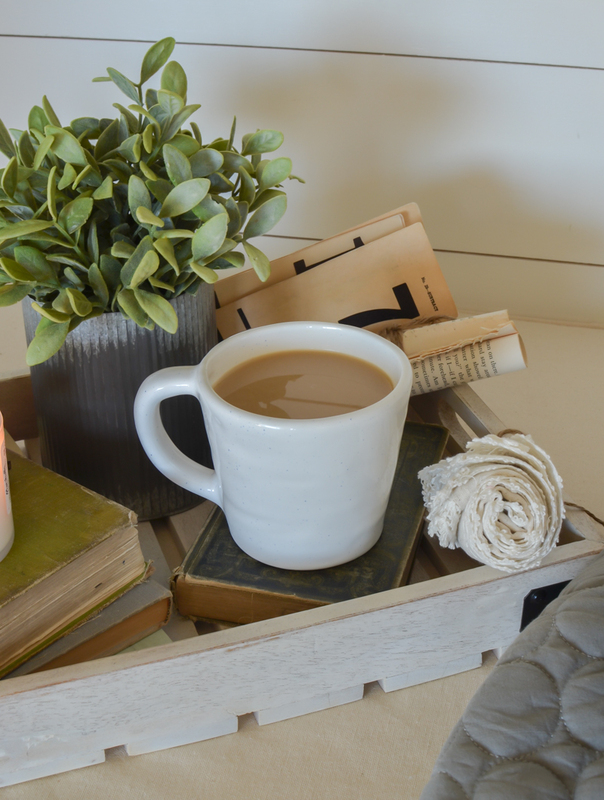 I made a trip to Marshalls a few weeks ago and I found several surprises that helped me create the coziest little reading area in our living room, so I’m excited to share it all with you today! Every good reading corner needs a little tray to hold books and other fun things like snacks and drinks! I picked up this vintage-y looking tray at Marshalls and it works really well to hold all of my reading nook necessities–it’s just the perfect size for this spot. 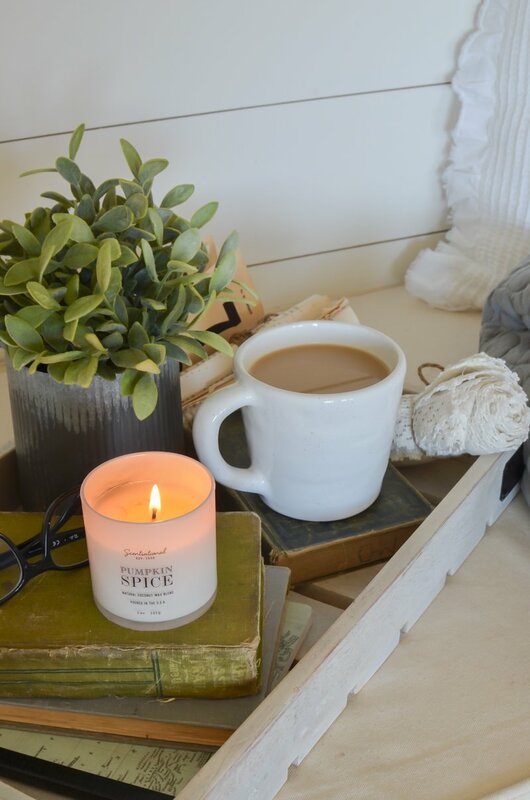 I filled it up with a few other goodies I found at Marshalls too, like that yummy pumpkin spice candle (which smells amazing! ), that large white coffee mug, and the notebook tucked under those old books. Basically everything I need while I’m reading can be put in this tray. Best part? I got it all for under $30, including the tray! BOOM. One of my favorite things to buy at Marshalls is throw pillows. They usually have an entire aisle (and sometimes even two aisles!) dedicated to pillows in all shapes, sizes, fabrics and colors. And of course that wide variety makes my pillow-loving heart very, very happy. Each time I visit Marshalls there’s a fresh mix of pillows, and this time around I found a gorgeous brand-name oversized white pillow with lace trim for only $24.99. Seriously you guys, how beautiful is that?! I definitely couldn’t pass it by. Then I also found that light brown ticking stripe pillow, which I thought would be perfect for this spot because it’s down-filled and super comfy. Another one of my Marshalls finds was this gorgeous quilted throw blanket. I love the frilly, lace-y trim detail and I thought it matched that big white pillow perfectly. I absolutely love this blanket and I was excited to find something that looked so hand-made for only $19.99 at Marshalls. 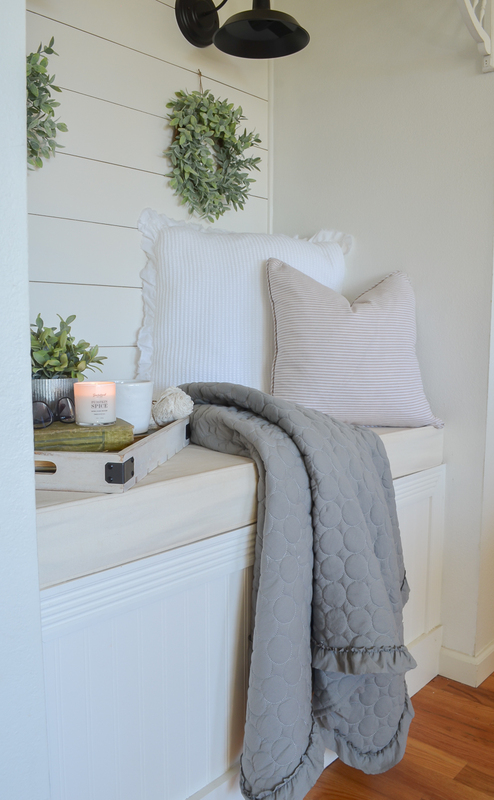 It’s quilted, so it’s warmer than a regular throw and perfect for the cold months ahead. It also reminds me of something my mom would have quilted when I was a little girl. So darn PRETTY. Lastly I have to tell you guys about that pair of little mini wreaths hanging on the wall. Of course I found those at Marshalls too (that’s honestly where I find all of the faux greenery you see throughout our home, including the boxwoods!) and I’m kinda loving them in this spot. 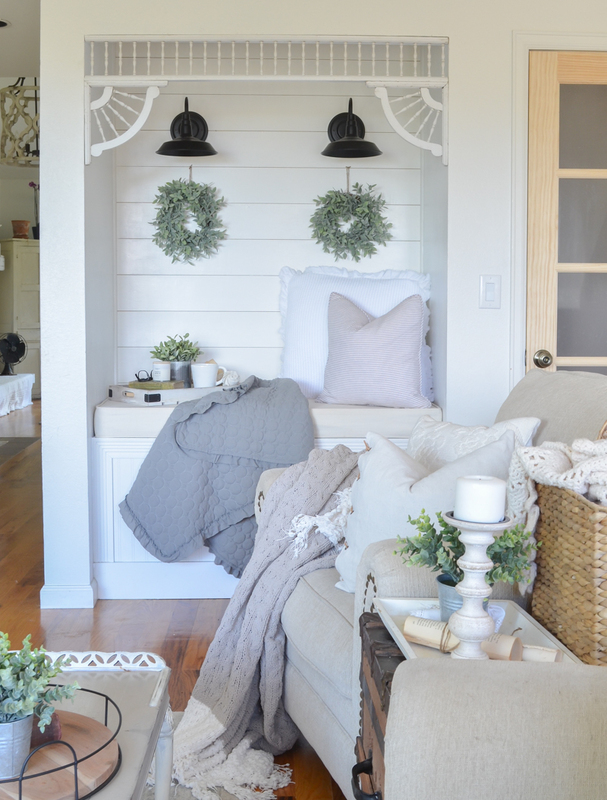 Greenery like that really has a magical way of instantly adding texture and warmth to any space, so they definitely do a great job of cozying up this reading nook and also adding a pop of color to that shiplap. 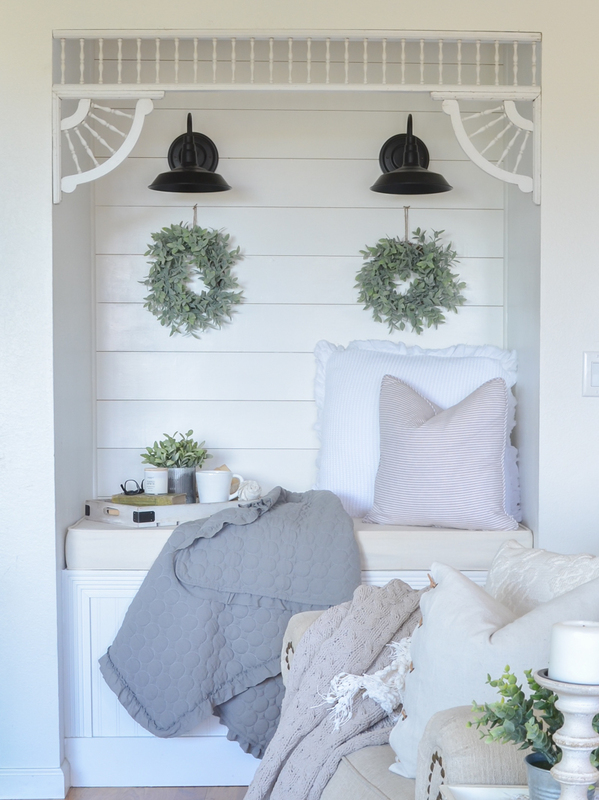 This cozy reading nook has become my favorite place to curl up with a good book and a cup of hot chocolate. Especially now that we are in full blown winter mode over here. Plus my kids love it, too. In fact, they are usually fighting over who gets to sit in the “lookout spot”, as they like to call it. 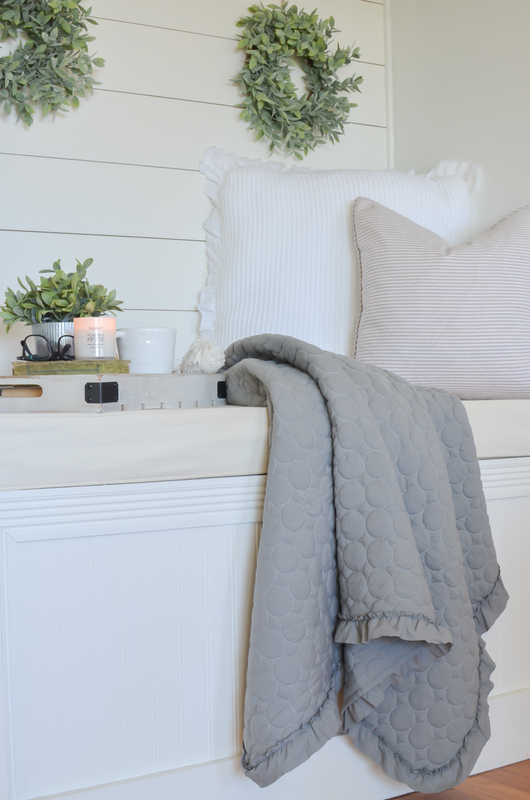 With the cozy pillows and that gorgeous quilted throw blanket it just feels like the perfect place to hunker down on a cold night. And like I mentioned earlier, I’m trying to focus on those happy little things to help me appreciate the cold months ahead. Thanks so much for stopping by the blog today! And big high five to Marshalls for having everything I needed to create this space. I honestly love everything I found and I had so much fun putting this cozy spot together! I do not know what I would do with out Marshall’s!! love that place and your finds are so perfect for your space. As always it looks so beautiful, Sarah! I hear ya girl. I am Marshalls addict for life!! Thanks Becky, I hope you can find that quilted throw blanket. It’s so good! Now I’m off to see if we have a Marshalls…you are a terrible enabler! WOW is all I can say!!!!!!!! I am going to start shopping at Marshalls, can you believe I have never been!!! And I have to say we have two within a 6 mile drive from my house and get this, one of my friends husband is a district manager for Marshalls. I have shame I know lolol. But starting Saturday that will be my first stop on my day of errands!! 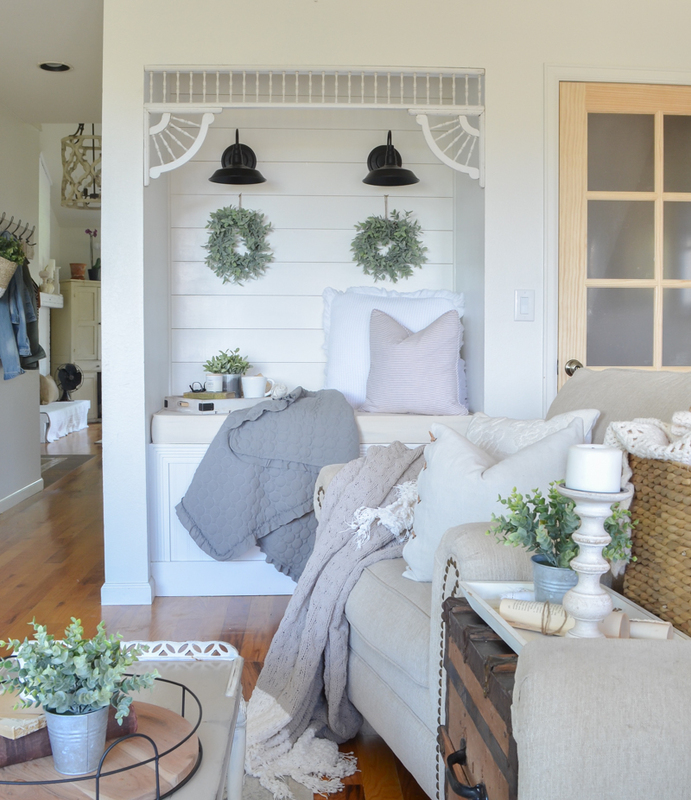 Your nook looks amazing as always but I must have that throw and the wreaths ASAP. Oh my goodness Tammy! You should definitely go. You will probably LOVE it. Hands down the best place to buy little pots of faux greenery! Our 10 year old loves to climb into the lined cedar closet high in our bedroom, a built-in feature of our 1950’s home. Your nook looks about the same width and depth, although our closet is much shorter & has sliding doors on the front. I had not thought of building him his own private reading nook, but your space inspires me. It’s about 50 inches wide and 30 inches deep. It was just an empty alcove before we turned it into a reading nook! It’s a beautiful space and I can’t help but think of what you’ve done for Marshalls! I haven’t had great luck at the one nearest me, but I’ll sure give it another look! Aw thank you so much Stephanie, I really appreciate that!! Love this space, Sarah! Would you believe I’ve never been to a Marshall’s store? They just built one a little over an hour away from where I live, so I think I’ll have to check it out soon! Love all the things you chose, it makes me want to go shopping right now! Definitely go check it out Kyla! You’ll LOVE it. Looks so inviting. 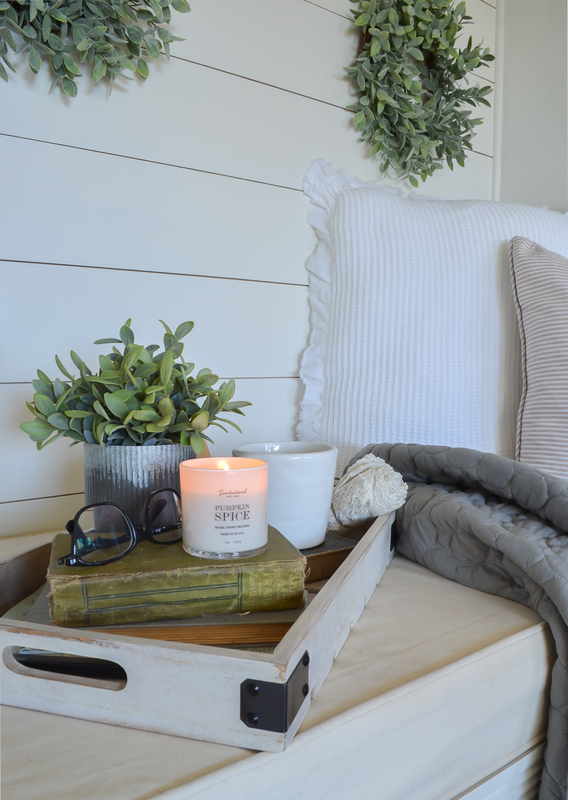 Your always great at creating a cozy space. thank you Dianne, cozy spaces are my favorite! I love your posts and your cozy little nook. I hope you don’t mind me saying this, because I have a bit of OCD LOL,,… but there are too many 2s in your nook. It’s some kind of decorator math that our eyes are attracted to odd numbers of groupings, like 3 in a group. You have the double trim on the sides, then the double lamps and now double wreaths. Try putting just one of your wreaths in the center where you have them hanging now and see if that isn’t more pleasing to the eye. Sorry, I just couldn’t help putting in my two cents. It’s just a thought, it’s still lovely like you have it. Love your posts and decorating on a dime!! I too love Marshall’s. We just got one down here on the coast awhile back. Sorry you’re freezing but it’s still burning up down here on the Mississipppi Gulf Coast. We can’t wait for some cooler temperatures! Stay warm! Hi, I read your blog from time to time and I enjoy it, I also love Marshals they have pretty quality items at very affordable prices. 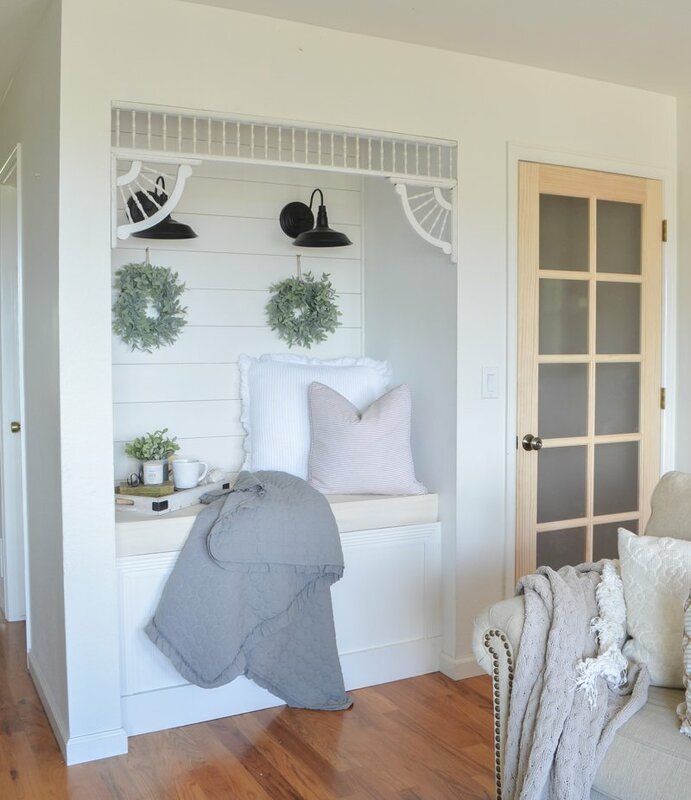 Your reading nook is very cute! Love your finds. I also love love your gray and white large trow, is that one also from Marshals? Last year I was inspired by your Xmas candles, I went to buy one. Thank you so much!! And yes, that gray and white throw is also another Marshalls find. Love that one too! 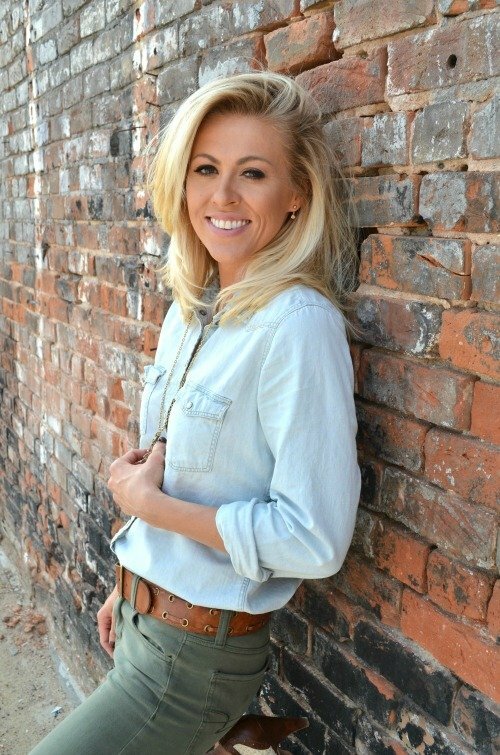 I have been following you for a short time and love your blog. The nook looks wonderful! Would you mind telling me a little your wall lamps and where I might find them. I’m in hopes they are battery operated as that’s what i’m in need of, and want the farmhouse look. I too love Marshall’s and the great finds there. Looking forward to you replay.